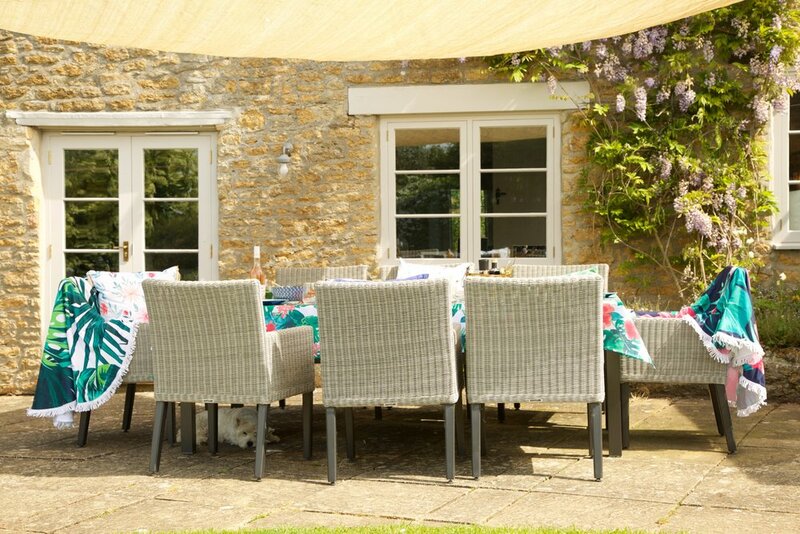 I have longed for this time of year, the month where we first laid eyes on the garden and I spied a few sprigs of wisteria in bloom climbing over the old crumbly walls above the back windows. As soon as I walked along the bumpy path from the back gate I could envisage how we would live here, that the garden would steal the show. 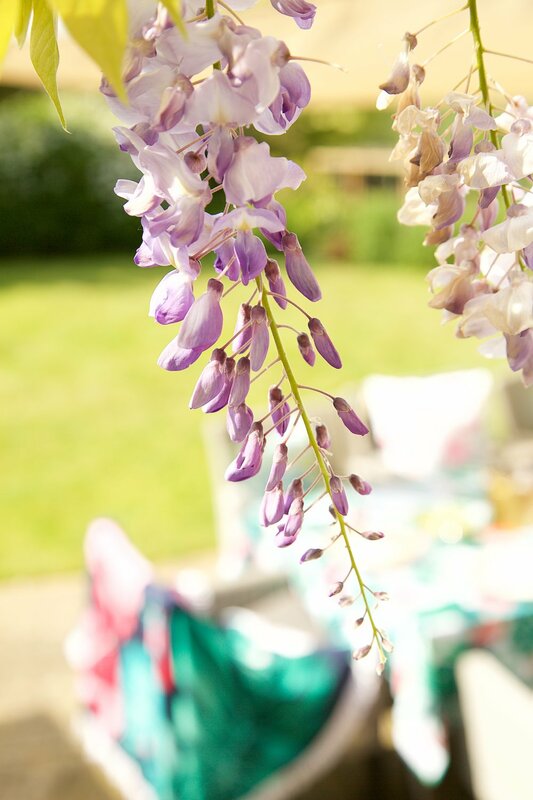 4 years almost to the day and everything has burst back into life, my wisteria hysteria is as strong as ever and slowly I can feel we are putting our stamp on the garden as much as we are the house. Just in time for the bank holiday fun this weekend! It’s easier to make quicker changes inside isn’t it? A coat of paint, a new carpet, not structural changes but aesthetic changes can transform a room. But a garden is harder. We are so lucky that the shrub beds are already full to the brim, a testament to 30 years of hard graft with a gardening glove. The patio itself is part of a bigger longer term plan so for now the circular shaped lawn looks back on the rickety pergola with an unruly kiwi plant that takes over each year (sadly no actual kiwis) and the open space in front of the double doors. We have brought in little touches like new outside lights and finally replaced our heavy timber round table and chairs, that had lasted so well for over ten years but gave up the ghost in the move. The back windows were replaced last year and painted in a pale warm grey and as much as I love the simplicity of a neutral scheme for me it lacked some serious colour and fun. I wish I was content with a palette of calming whites and greys but I just adore seeing a pop of pink or blue peeking out of the rattan chairs and when I spied all the gorgeous greens in Homesense - well - sold to the lady’s patio in need of some late spring cheer! Now I’ve been a Homesense fan for almost the 10 years it has been in existence after discovering it was part of the TK Maxx family. When we lived in Weston Super-Mare I probably “popped” in almost every week when I scooted to join the motorway, to see what new lines had been added that week. 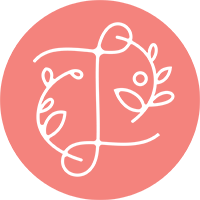 Exciting news for all those living in Weston Super-Mare, a new Homesense opened yesterday within the existing TK Maxx store in the North Worle Shopping Centre, be sure to check it out! Taunton is now my closest store (but check for your nearest here as they have over 50 stores across the country ) and has two floors of shelves bursting with seasonal and all year round homeware. Homesense is my go to store for unusual finds. I can only imagine that being part of their buying team must be a dream job! I still get lovely people asking where I found the boy’s hanging metal plane that hangs between their beds and I am so glad I didn't leave it on the shelf when I was ‘umming’ and ‘aahing’. If you see it and love it, buy it as what you see is what is available. There aren't hundreds of each products tucked in the stock room and that’s what makes it even more attractive for me. You won't end up with the same print or cushion as everyone else in the area! The offer of products with savings of up to 60% off RRP is an added bonus too. I walked into the store and it was like an explosion of colour, print and pattern. 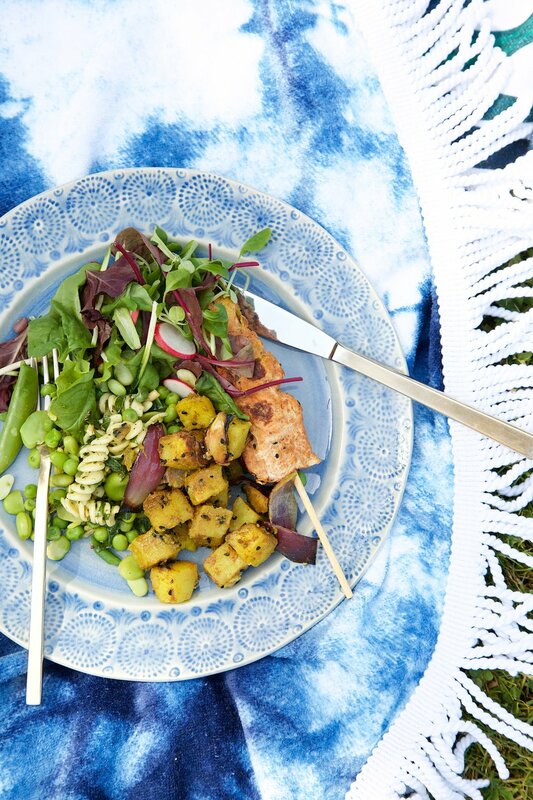 The tropics had truly come to Taunton and with the incredible spell of exotic temperatures we have all been blessed with and the promise of more sun this long weekend it is the perfect time to start eating outdoors again and make the most of the garden, the park or the beach. 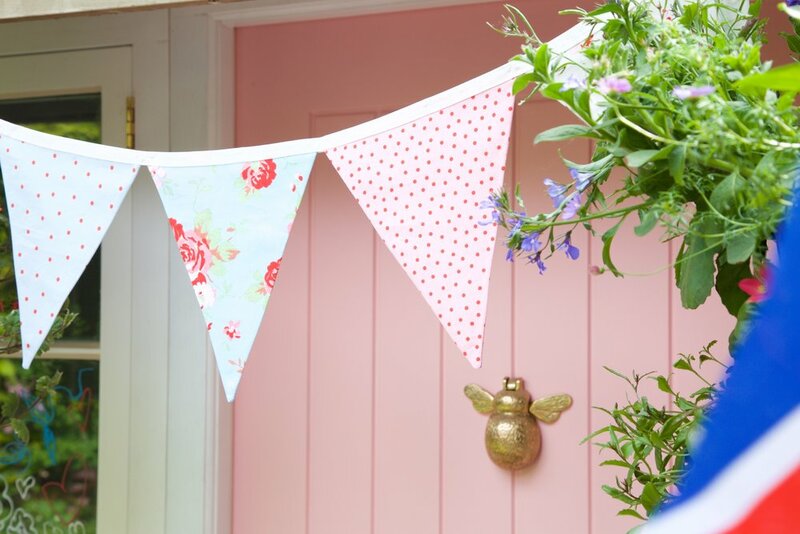 If you plan on visiting a Homesense store ahead of the bank holiday weekend then you will be spoilt for choice. Whether you love palm print, rainbow colours, simple muted neutrals or Moroccan inspired patterns, there is something to suit all tastes. I love how you can mix and match styles and I decided go bold or go home! Hints of gold and greens that tie in with our cutlery - everyone needs a caddy in their life. 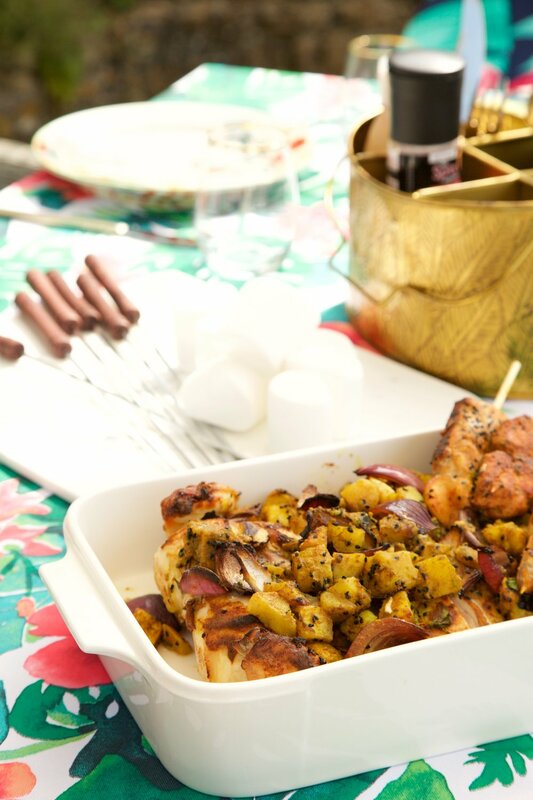 I stuff mine with bottles of sauce, pepper, salt and carry the cutlery to the table in one of the sections. I had a good trawl through the clearance section and there were a few in other designs but I loved the slightly tarnished finish on this one. I went in with BBQ tools in mind but I came out with banana leaf print cushions for £12.99, tablecloths (at £12.99 for a huge 264cm long tropical print wonder I had to get a pair!) and marshmallows to roast for dessert. Always, always go for the big green trolley when you walk in, that’s my tip! 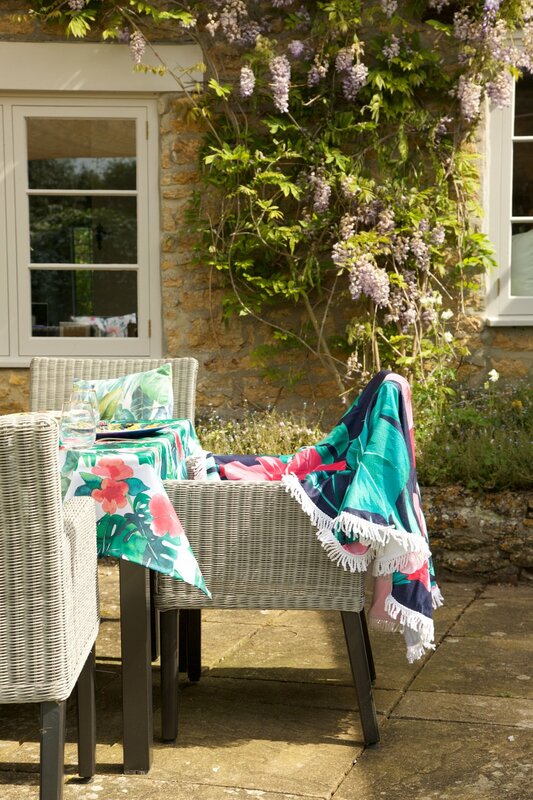 We are all set up for summer and the bank holiday now and if it rains well, who cares, we can use the tablecloth as a picnic blanket and move the party indoors! Get yourself down to your local store this weekend for a good nosey, but be warned you'll want it all! I'm not sure I have ever told the story about the day we collected Mabel and Moose from their lovely white fluffy mummy Abby Lloyd in Wales. 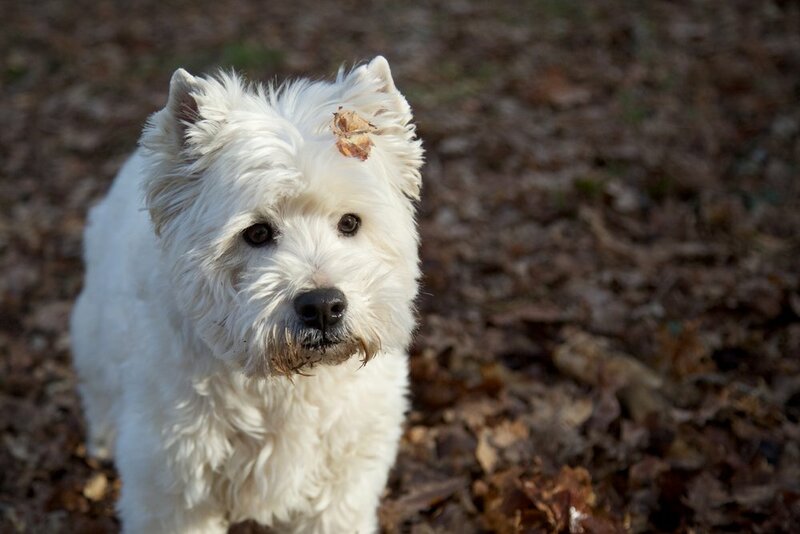 About 18 months earlier we had fallen in love with the prettiest West Highland Terrier I have ever seen (cover your ears Mabel). It sounds ridiculous but she was. This perfectly square face, cheek hair as white as the snow, and a tummy that was like stroking cotton wool. We had talked about looking at getting a dog or dogs, a matching pair, as Rich was looking to change his job to work from home. I did about as much research as I did when we were planning our wedding! What breed would be right for us, for us in 10 years when we hopefully had a family, which breeds have health problems, the pros and cons of bigger dogs vs smaller breeds, breeders to avoid like the plague and those you could trust with your life, not just the puppy you were buying from them. You name it I researched it. And that's when we found Abby and all the other woofers faded into the background. We travelled to Wales one rainy Saturday morning after exchanging emails and a couple of phone calls and met the kindest couple and their four beautiful dogs and instantly felt a connection. Jan had an impressive list of awards for her prize winning Westies but it was her overwhelming warmth and love for her puppies that bowled us over. Fast forward 18 months to 13th August and we headed to London from Weston-super-Mare for a day trip to celebrate our anniversary with a tour of Buckingham Palace. It rained, just like it did on our actual wedding day, and we left London in the afternoon having oohed and aahed at the golden coach and State Banquet tables, not to head straight home but to head to bring our furry babies home! We'd been on the end of the phone when they were born, "We have your girl!" "Mabel is here" and then "Ooh another girl, and another, oh wait the last one is a boy!" We'd been to see them a few times before they were big and strong enough to come home, and were completely in love with these tiny snowballs that fitted in your hand. I hadn't grown up with a dog but now I cannot imagine not having one or two as part of our family. We miss their scuttling paws across the tiled floor when they are on a mini break at my in laws who love them as much as we do and help us when we need a dog sitter and they just co-exist with the boys without fuss. They are part of the furniture, simply just part of our dynamic. They have travelled with us since they were a couple of months old, they come to friends' for sleep overs, they feel like Southbourne is their second home. They know every inch of my Granny's flat, they know that beyond the cliff is the zig zag path down to the beach hut, where they patrol "their" 30ft of the promenade. I am convinced they feel the same the same as we do about this stretch of coastline, they remember which steps lead to the hut, they have their own spots where they rest after tearing around in figures of eight on the sand. Mabel likes to sit on the little ledge and Moose sunbathes on the towels, watching the other dogs go by, deciding which one he wants to pop down to the beach and say hello to. They are hilarious, sensitive, loyal and two of the stars of the new Harringtons campaign with Ben Fogle to get us all inspired around the country to try new routes with our woofers. There was only one place we wanted to share as our favourite route and that's a wonderful hidden headland called Hengistbury Head a few miles along the Dorset coastline from our beloved Southbourne. If you didn't know it was there you would miss a treat. There's a handy car park opposite a large area of open grassland where you'll find kite flyers of all ages at the bottom of Warren Hill. We park up as quickly as possible as the dogs go wild in the back, knowing exactly where they are, and head off down our favourite track. 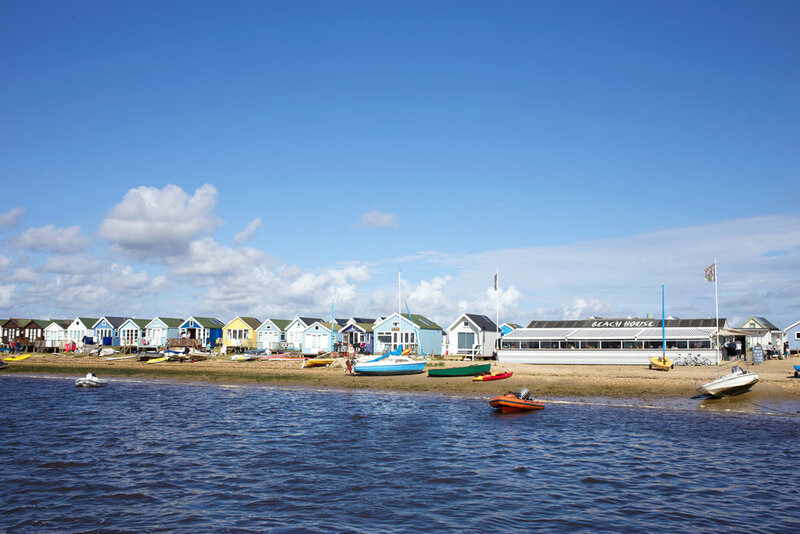 It has everything, moorland, heathland, the beach, a nature reserve, woodland and the Mudeford spit - famous for it's multi coloured beach huts and one of the best crabbing spots! There's gentle slopes or more adventurous terrain if you want to take in the spectacular views from the top of the nature reserve, but we are just as happy winding through the trees, veering off the tarmac path down to skim stones across the bay, ending at the sand dunes and the upturned rowing boats. It’s a place where you see everyone from newborns in slings wrapped up in blankets and padded coats with ears poking from the top of their hoods, to groups of friends with picnic blankets or a portable BBQ. From grandparents trying to keep up with their broods who have raced on ahead to the Quay armed with their crabbing buckets and fishing lines to kite flyers and bird watchers. I’ve always felt it’s a place where anything and anyone goes. You start in the open grassland, with the tall whispy blades that shelter the golfers from the roadside dancing in the breeze, and end up meandering through the purple heather, past the grazing cows, rustle through the woodland with the carpet of oak tree leaves, past the bay with the bobbing birds and end up on a the sandy shores that look out onto the white Polar bear cliff face and the Needles. It’s everything Great Britain has to offer in one 45 minute stroll or 25 minute race if you are blasting through on your scooters! The track between the Hiker cafe and the land train platform is a well trodden path at all hours of the day. Early morning runners and cyclists watch the sun rise over the rowing boats and sailing dinghies, that are waiting for the warmer weather and all the beach hut owners to come back and decamp for the summer. Then as the day goes on, you see parents and buggies, school groups heading for the wildlife reserve and dog walkers smiling to each other. It’s a place you can't help but be happy at, even on a cold and windy February Sunday! We have been here in rain and shine, summer and winter and seen the heather change from dark green to vivid pink come early autumn. And now we are not tied to tea time routines it's so nice to stay out a little longer, see the sun set over the lagoons and finish up with dinner out at the Beach House. Sometimes we are all so motivated to get out before or just after lunch, walk off that big roast dinner, but dusk is just as lovely a time to explore. It was bustling. That post lunchtime rush of people and every breed of dog you can imagine. 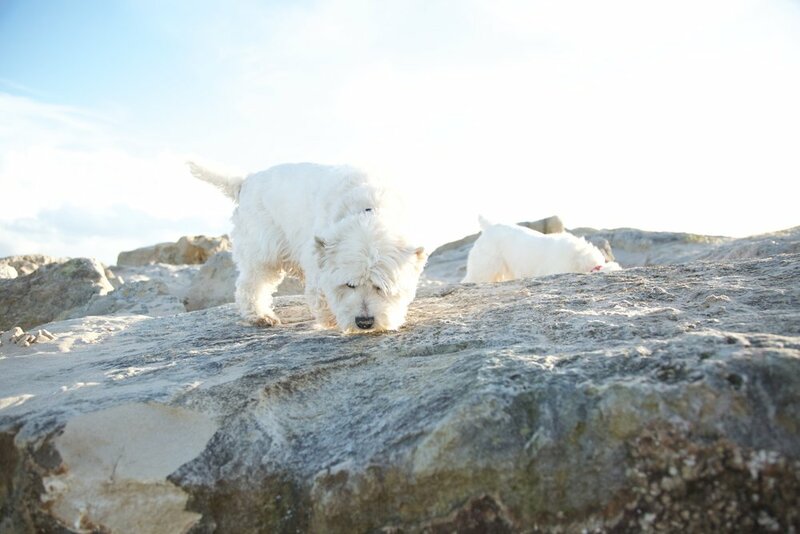 There were moments of ebb and flow, when we stopped for the Westies to say hello to a new furry friend, when we veered off the main track to head to the pebbly shore of the bay, overlooking the pretty town of Christchurch. We sauntered along the path that hugs the bay and as you take in the birds in flight landing on the still water, you can't help but want to slow your pace down, breath in the sea air and just take in the view. You don't have to stay on the main path, you can dive off down to the beach and walk along the shore line. The visitor centre that you pass within minutes of leaving the cafe has all sorts of information about the area, the wildlife, the conservation efforts and the archaeology of the area but if you want to take your own route, just keep walking forwards and eventually you will come to the Beach House cafe and ferry jetty to Christchurch. I love watching the landscape change through the seasons, when are down for New Year with friends, when we are bottling back from Mudeford on the land train over the May bank holiday weekend and in the summer months when the cousins all run along the sandy path barefooted and sun kissed. I have photos of the boys growing up on these walks. Jumping through the heathland, getting braver as they get bigger. There are some beautiful wood carvings at Hengistbury Head. Our boys loved the carvings of the land train that they could climb on to see over the reeds and across the bay to the ferry jetty in the distance. Next up is “the best tree to climb in the world!” according to our boys. It’s branches are ideal for younger children and older ones. One minute it’s a pirate ship the next it is a tree house. We had trouble tearing our boys away! Amongst the ivy bound trees is a hidden treasure. Who doesn’t love a tree swing?! We all had a turn and there’s enough room in the clearing to really swing your legs and go high up in the sky! The lagoon is teaming with birds and you need to look out for migrating Dunlins and Ospreys that pass through the headland. Kestrels and Skylarks are just a couple the 300 species of birds that are known to inhabit Hengistbury Head. The rocky groynes that protect the beach from further erosion are an adventure in themselves. The boys made imaginary dens and caves and love to pretend there are all sorts of fish in the cracks beneath them waited to be found. Whether you return to your car with windswept hair and rosy cheeks in the winter or with sticky hands from an ice cream that has dripped down the cone on a hot summer’s afternoon, I defy anyone not to leave without a sense of achievement. That either you’ve got all the kids out and in the fresh air, that you’ve taken your dogs for a lovely long walk or spotted a new breed of bird. There will be something that you will remember that makes you happy. It’s a place you want to revisit and that’s the magic. If you get a chance to follow our route we have three tips for your visit! Check out the other fab routes with Harringtons around the country to explore on your dogventure! *This is a sponsored collaboration with Harringtons and it was an absolute pleasure to be part of it. The dogs have even switched to their hypoallergenic food and won't touch their old favourite any more!